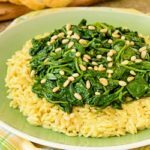 Spinach Topped Creamy Orzo pasta is a quick and easy side dish. The sauce is made with parmesan cheese, egg, and cream. It's comfort with healthy on top. Cook pasta according to package directions. Drain and do not rinse. While the pasta is cooking, whisk together cheese, egg, and cream in a large bowl. Add cooked pasta to cheese mixture and stir to combine. The heat from the pasta will cook the egg and melt the cheese. Let sit while preparing spinach. In a deep saute pan or skillet over medium heat, add olive oil, garlic, and red pepper flakes. Cook for a couple of minutes until the garlic is fragrant and the oil has warmed. Do not brown the garlic or it will become bitter. Add spinach and toss frequently while cooking. Add salt and pepper to taste. Cook until the spinach is completely wilted, it only takes a few minutes. Transfer orzo to a serving plate. Top with sauteed spinach. Garnish with pine nuts.